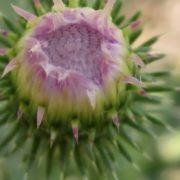 Thistles are prickly plants. 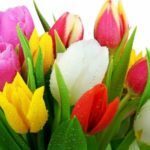 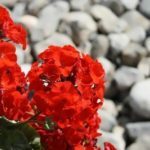 Some kinds have nice flowers, and people grow them as garden plants. 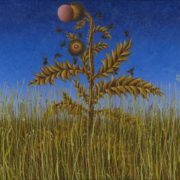 This plant can grow to more than 2.4 meters tall. 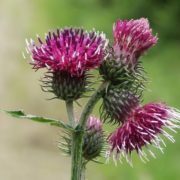 It usually has prickly leaves with ragged edges. 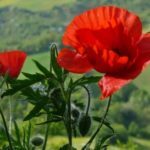 They are green and are sometimes covered with white hairs. 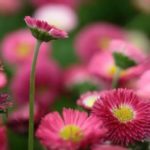 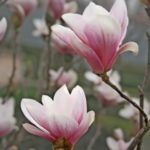 Their flower is actually a group of small flowers that are mostly pink, purple, or yellow. 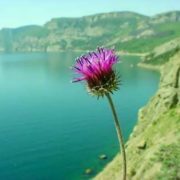 They produce feathery seeds that scatter in the wind. 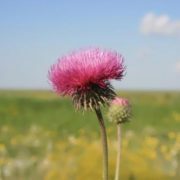 Thistles can grow in many climates and soils. 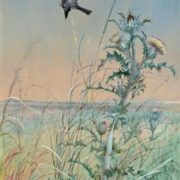 There are over a hundred species of thistle. 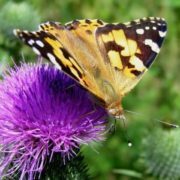 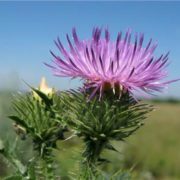 Milk thistle, star thistle and holy thistle have been used and cultivated for medicinal purposes. 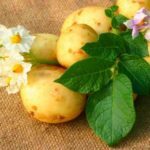 It is used as a dietary supplement for the cardiovascular system. 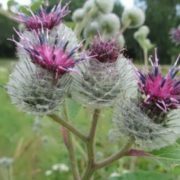 In addition, medicines based on thistle have bactericidal effect, stop bleeding and increase smooth muscle tone. 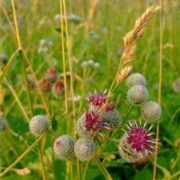 In some Baltic countries it is used as a cure for coughs and asthma, various skin diseases. 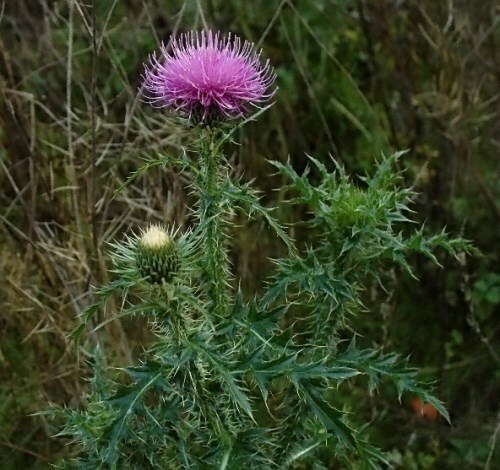 In modern medicine thistle is used to fight tumors and as a cure for tetanus. 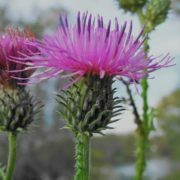 In some countries, thistle is used for recovery after surgery and for the prophylaxis of autoimmune diseases such as lupus. 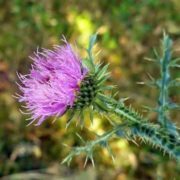 In addition prickly thistle is used as a diuretic, as a cure for rheumatism, and sometimes as a cure for the common cold. 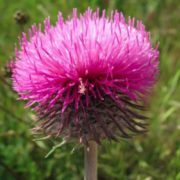 A decoction of dried thistle flowers is used to treat insomnia and bronchitis, thistle tincture treat hemorrhoids, urethritis, cystitis and edema. 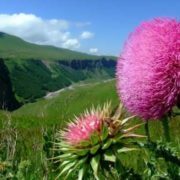 Thistle is widely used for the treatment of joint diseases: gout, rheumatism, etc. 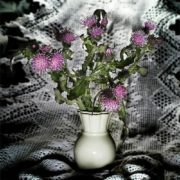 Thistle symbolizes a challenge, asceticism, vindictiveness, misanthropy. 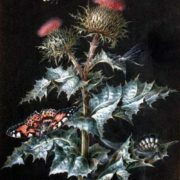 In Christian art thistle is the emblem of martyrdom. 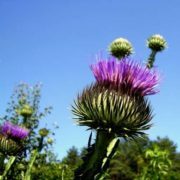 In China, the thistle is a symbol of resistance and durability, because it does not lose its shape after cutting. 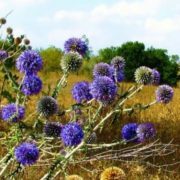 In Roman mythology, Ceres, goddess of the harvest, the patroness of fertility, lights a torch made of a dry thistle. 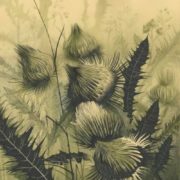 Thistle is the national symbol of Scotland. 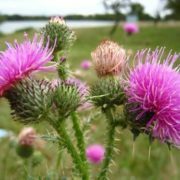 At one point, the Scandinavians planned to attack a Scottish village. 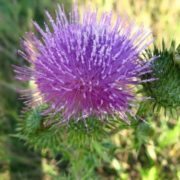 But since the Scots knew they were coming, they started to prepare for war. 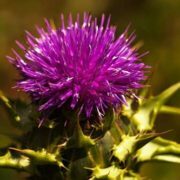 Late at night, the Scandinavians came in their bare feet so as to not awaken the Scottish warriors in the village. 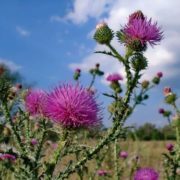 But the thorns of the thistle hurt their bare feet. 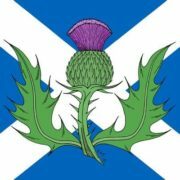 Their howls of pain pierced the silence and the Scots awoke to fight the enemy. 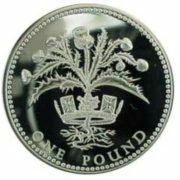 In 1702 thistle became a British emblem with the motto “Nemo me impune lacessit”.